Willy Teddy Bear by Steiff. This beautiful hand made piece, in cinnamon tipped mohair, wears the white ear tag, signifying this item as a Steiff limited edition, together with the famous gold plated Button in Ear. Limited edition of only 1031 pieces worldwide. Product details: fully jointed (loosely jointed head and arms), safety eyes, synthetic filling material, non growler, size 33cm. Comes boxed, together with a numbered certificate of authenticity. WILLY TEDDY BEAR Towards the end of the long summer, Willy Teddy bear has been eating enough food to sustain him through his winter rest. Now he is tired – his eyes are small and his body and legs have become heavy. He is looking forward to having a long sleep in his cosy cave among the fern, moss and lichens. 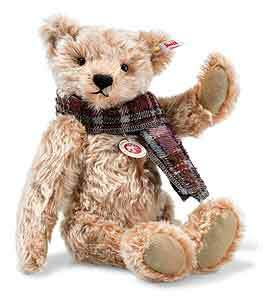 With Willy Teddy bear, Steiff marks the autumn with a hibernating bear for collectors: with steel granulate in his body, arms and legs, a loosely jointed head and a checked scarf. So if you are planning on a quiet, cosy winter, you will find him an ideal companion. Of course, bears never go into a really deep sleep when hibernating during the winter, so Willy is always ready for an adventure.